This type of volume spreads files across the bricks in the volume. 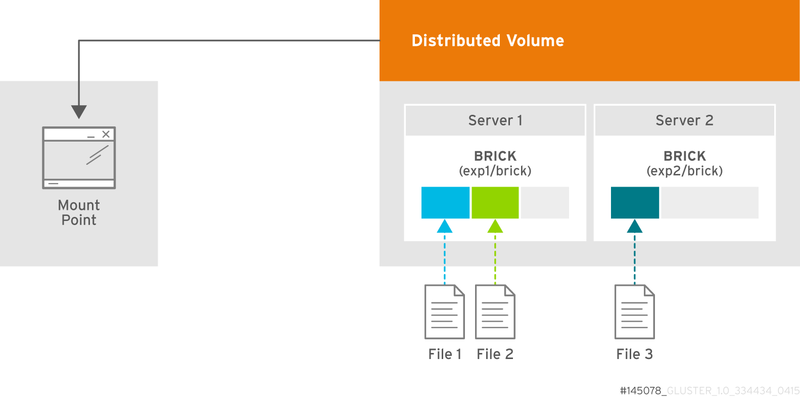 Distributed volumes can suffer significant data loss during a disk or server failure because directory contents are spread randomly across the bricks in the volume. Use distributed volumes where scalable storage and redundancy is either not important, or is provided by other hardware or software layers. Use gluster volume create command to create different types of volumes, and gluster volume info command to verify successful volume creation. A trusted storage pool has been created, as described in Section 4.1, “Adding Servers to the Trusted Storage Pool”. Understand how to start and stop volumes, as described in Section 5.11, “Starting Volumes”. Run the gluster volume create command to create the distributed volume. The default value for transport is tcp. Other options can be passed such as auth.allow or auth.reject. See Section 11.1, “Configuring Volume Options” for a full list of parameters. Run # gluster volume start VOLNAME to start the volume. Run gluster volume info command to optionally display the volume information. The following output is the result of Example 5.1, “Distributed Volume with Two Storage Servers”.